Contemporary Istanbul, which will run until Sunday, is visited by thousands from all age categories. Set to run until Sunday, the 12th Contemporary Istanbul International Art Fair, which coincides with the opening of the 15th Istanbul Biennial, organized by the Istanbul Foundation for Culture and Arts, and whose curators are Elmgreen & Dragset this week, is accompanied by events at prominent art institutions such as Sakıp Sabancı Museum, Istanbul Modern, Pera Museum, Borusan, Elgiz Museum, Akbank Art and Arter this week. This week's events are organized to position Istanbul as a global culture and art center -- big steps taken to attract the international attention that Turkey's contemporary market deserves, while also making Istanbul a center of attraction. Sakıp Sabancı Museum (SSM) hosts Chinese artist Ai Weiwei's large house exhibition that is on display inside and outside the museum, which is located in Emirgan, centrally located on the Bosporus. Turned into a museum by the Sabancı family in 1998, the museum is in the heritage of Sabancı University. The Sakıp Sabancı Museum hosts the first exhibition by Ai Weiwei in Turkey with the support of Akbank. The latest works by the artist along with a large collection of his previous works are presented in the exhibition, which runs until Jan. 28, 2018. The exhibition, which focuses on the Weiwei's porcelain works, narrates both the artist's life story and his approach to the handcraft tradition and art history. The Arter Gallery is currently hosting Turkish artist CANAN's works that consists of new productions produced since the end of the 1990s. Arter, an initiative by the Vehbi Koç Foundation (VKF), opened in 2010 to present a substructure to produce and present contemporary art. CANAN's exhibition, "Behind Mount Qaf," is on display until Dec. 24. The exhibition, which spreads across all the floors at Arter, presents an extensive perspective on the artist's practice and was curated by Nazlı Gürlek. "Behind Mount Qaf" presents new and old works by the artist. Borusan Contemporary hosts the solo exhibition of American artist, curator, writer and educator Diana Thater, a prominent figure in film, video and montage since the beginnings of the 1990s. Borusan Contemporary will present various works from its own collection from Sept. 16 until Feb.18, 2018 in the office areas of the Haunted House. 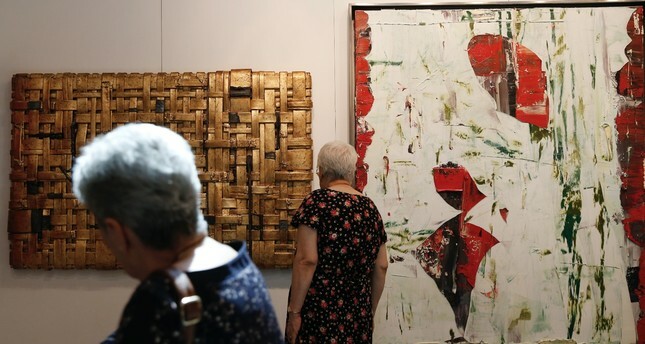 The Elgiz Museum hosts a temporary exhibition that includes contemporary art works by prominent local and international artists and works from the Elgiz collection that haven't been previously presented. The 9th terrace exhibition continues until October. Elgiz Museum was established by Sevda-Can Elgiz in 2001 as the first contemporary art museum in Turkey. Istanbul Modern will be one of the main centers of the 15th Istanbul Bienal. ISTANBUL Modern is also hosting the exhibition "Artists in Their Time." Istanbul Modern, the first museum to have modern, contemporary art exhibitions in Turkey, was established in an area of 8,000 m2 in the Tophane district, near the Bosporus in 2004. The Pera Museum hosts the 15th Istanbul Biennial Sept.16 to Nov. 12 in collaboration with the Istanbul Culture Art Foundation (IKSV). Artists on display at the Pera Museum, one of the main exhibition centers of the 15th Istanbul Biennial, are Njideka Akunyili Crosby, Alejandro Almanza Pereda, Burçak Bingöl, Monica Bonvicini, Louise Bourgeois, Berlinde De Bruyckere, Vajiko Chachkhiani, Gözde İlkin, Liliana Maresca, Lee Miller, Aude Pariset, Sim Chi Yin, Dayanita Singh, Tatiana Trouvé, Tsang Kin-Wah, Andra Ursuta and Fred Wilson. Akbank Art host the "Black Noise" exhibition, which was curated by Ekmel Ertan and Işıl Önol, in honor of its 24th anniversary. It was established by Akbank in 1993 to support contemporary art in Turkey. The 15th Istanbul Bienal, which will be held in the six neighboring venues by the curators Elmgreen & Dragset starting Sept. 16, can be visited for free till Nov.12. The works, which open the concepts of house and neighborhood to the discussion, of 56 artists from 32 countries will be in the bienal this year. Here are the exhibition sites: Galata Private Rum Primary School, Istanbul Modern, ARK culture in Cihangir, Pera Museum, Küçük Mustafa Paşa Hamam and Yoğunluk Studio in Asmalımescit. The artists in the biennial are opening discussions about house, neighborhood, belonging and mutual life from various perspectives. Some works narrate how situations and conditions in domestic life change and how our neighborhoods transform, while the others handle how we overcome geopolitical problems on a micro scale. The biennial creates areas where past and future, blues and anger and wishes and dreams blend by taking form via the analytical and individual expressions of the artists.